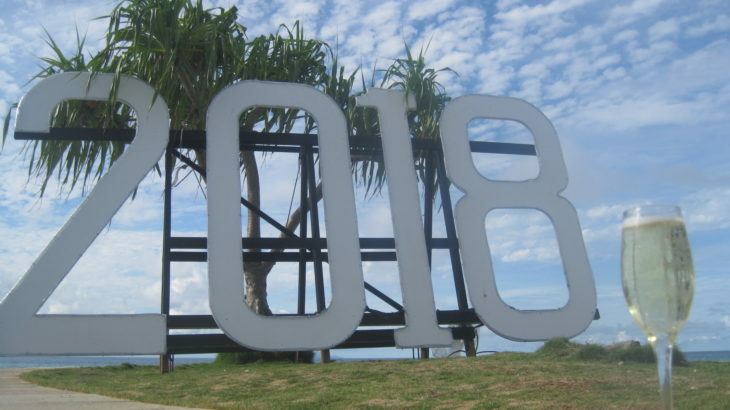 When Milena and I decided we were going to Fiji and knew we were going to be there for New Years Eve, we first researched where we wanted to stay NYE (as we knew it would be popular and most likely already booked as we were late to planning this trip). 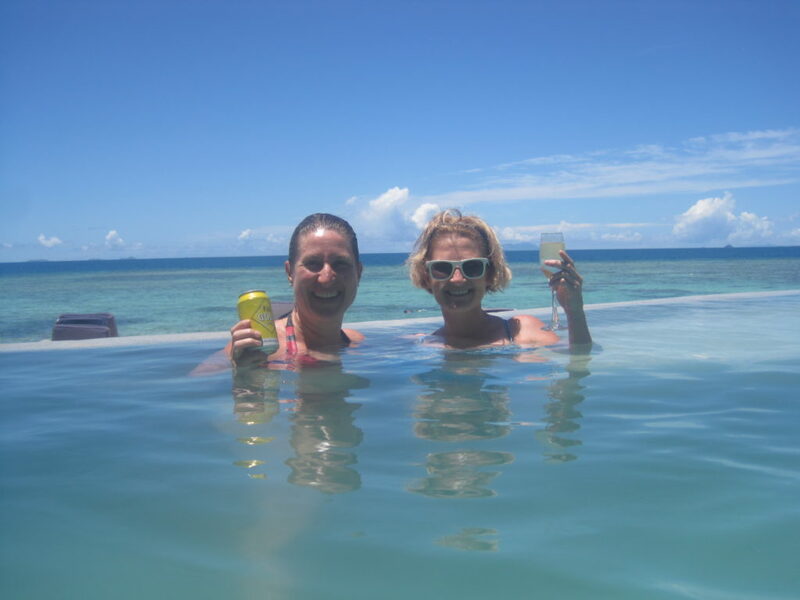 We decided to go to Beachcomber Island Resort which is known as the fun party island in the Mamanuca Islands. 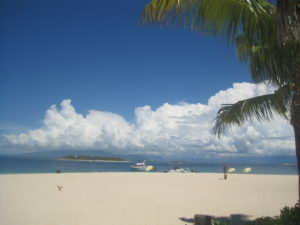 This group of 20 or so almost picture perfect islands are the closest group of islands to the mainland (about 45-60 minutes by boat) so a popular day trip for tourists that don’t want to leave the comforts of the Hilton/Westin/Sheraton chains on the mainland but still want to see the islands. This group of islands is by far the most popular as they are picturesque, close to the mainland and the water is just so blue…you really can’t stop starring and commenting on how amazing the water colors are. 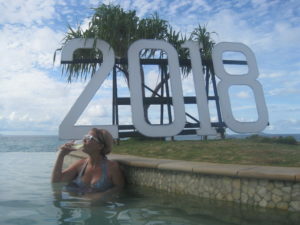 After we landed at Nadi airport, we decided to head north to the Yasawas for the first 3 nights, then return to the Mamanucas Islands for New Years fun and decided Beachcomber would should be the best for all things we wanted for NYE and a couple more nights. Well…as said in the Indiana Jones movie The Last Crusade, “we choose poorly”. Luckily, our heads didn’t explode to dust with our poor choice like in the movie, but we struggled through this resort stay as it wasn’t as we expected (or advertised). 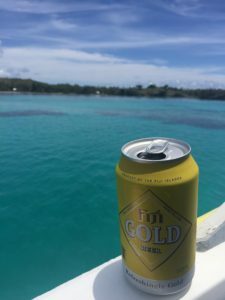 So as seasoned travelers, we quickly figured out how to make the most of our 3 nights and found other excursions and such to occupy our time and we did find paradise! When I was reviewing my photos from this part of the journey, I realized I took very few photos as there wasn’t much new stuff on the tiny island. So that meant…time to get off the island and find new fun. 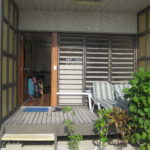 I will say, Beachcomber was a beautiful white sand beach, and we did have a really nice private beach front room (with A/C and a fridge for our wine and champagne…which was key) so we spent more time in our room/balcony than out in common areas. Beachcomber was THE island to be on for New Years and many of the local workers from other neighboring islands/dive shops all came to Beachcomber for the celebration. So the island and bar area were busy. 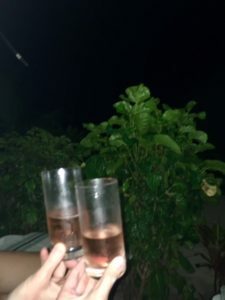 We started off the night with a little Chandon Rose on the balcony as soon as the sun set…and then off to a so called dinner….and by that I mean we met some Australians and had drinks while they ate the slop and I had a quest bar from home. 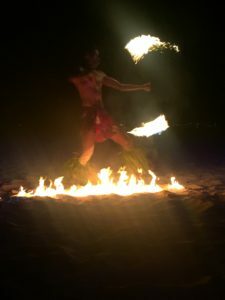 One of the highlights of Beachcomber was a local Polynesian dance crew that performed every Saturday (and stayed for Sunday for New Years Eve). So we got this fun entertainment for 2 nights. At first, it felt like a Hawaiian Luau with traditional dancing. 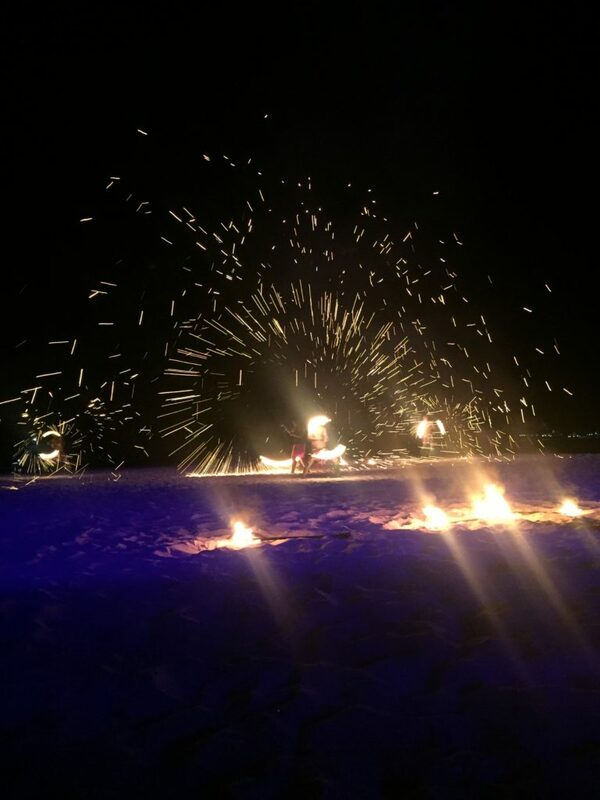 After the dancing, we moved out to the sand and the fire eaters, fire dancers and fire spinners and the show came to life for a fantastic entertainment. 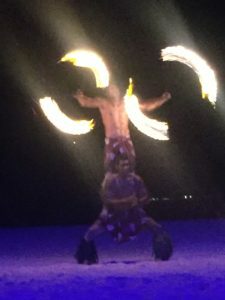 There was even one woman that both spun the fire sticks and spun the fire balls….and I’ve never seen a female fire performer. 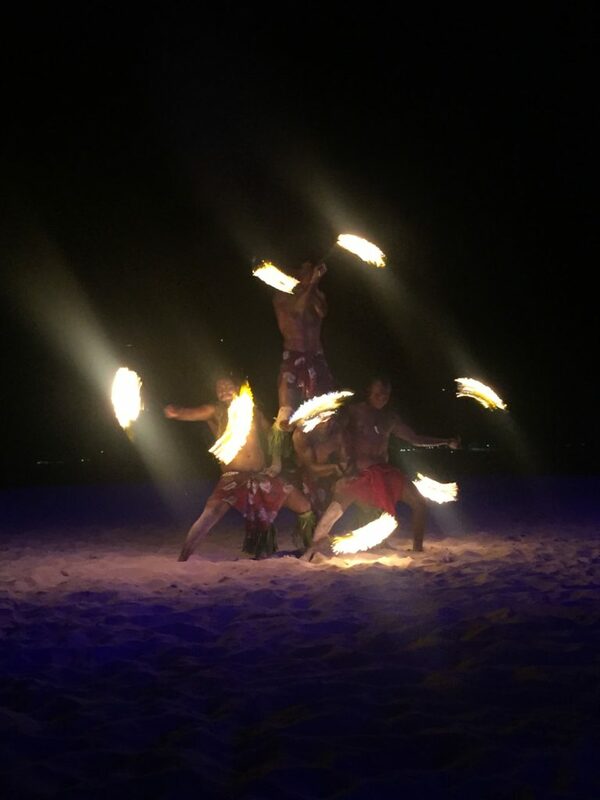 The grand finale of the night was the 4 of them spinning fire and making it look like fireworks all over the beach. It was quite impressive! We were now entering our second full day on this tiny island and Milena and I had a great idea of how to get off the island…call the dive shop on the neighboring island that we were going to dive with and see if they would come pick us up “to get scuba paperwork done the day prior” (and we could stay on that island as a day tripper for lunch, pool time and happy hour). It worked and they came to pick us up 5 minutes later and we had the most wonderful day at Treasure Island. 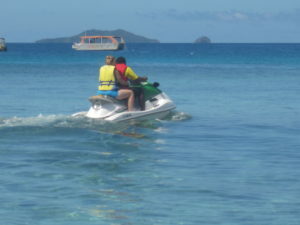 The GREAT ESCAPE…in our tiny yellow speed boat…we were whisked off to paradise! 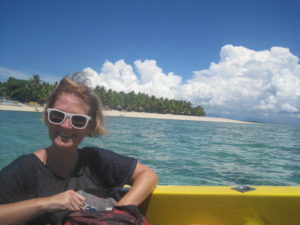 The captain was loving the California girls in his boat…couldn’t believe how far we traveled to Fiji. At Treasure Island, we met loads of friendly people, had the best lunch ever and celebrated the New Years in a much more “civilized” way. That was the only word we could use over and over again as Treasure Island Resort was so civilized and wonderful! 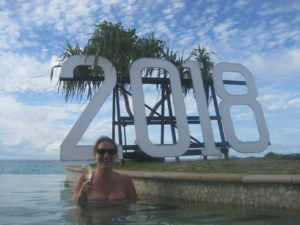 We did our “New Years part 2” on Treasure Island with champagne in the pool by the 2018 sign. We enjoyed our “day trip” to Treasure Island so much we couldn’t wait to return the following day for our morning scuba dive and then afternoon lunch and pool time there. 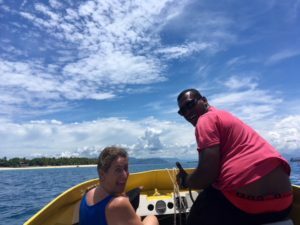 Unfortunately, we tried hard to scuba dive in the Mamanuca Islands, but after two failed attempts, we didn’t get to scuba. On the 2nd attempt, we waited 90 minutes all suited up but the boat motor wasn’t working so we couldn’t get out to the dive site. 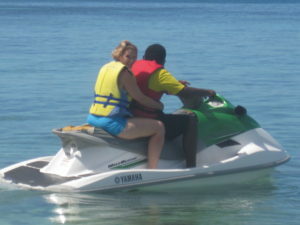 Bummer…but to make up for a broken boat, the dive center said they would take us out on a jet ski ride. 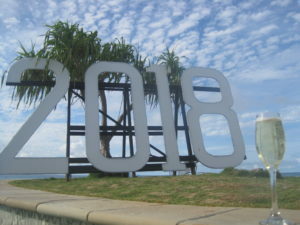 So that brought a smile to our faces and off we went. Milena was off first for a little speed on the water. 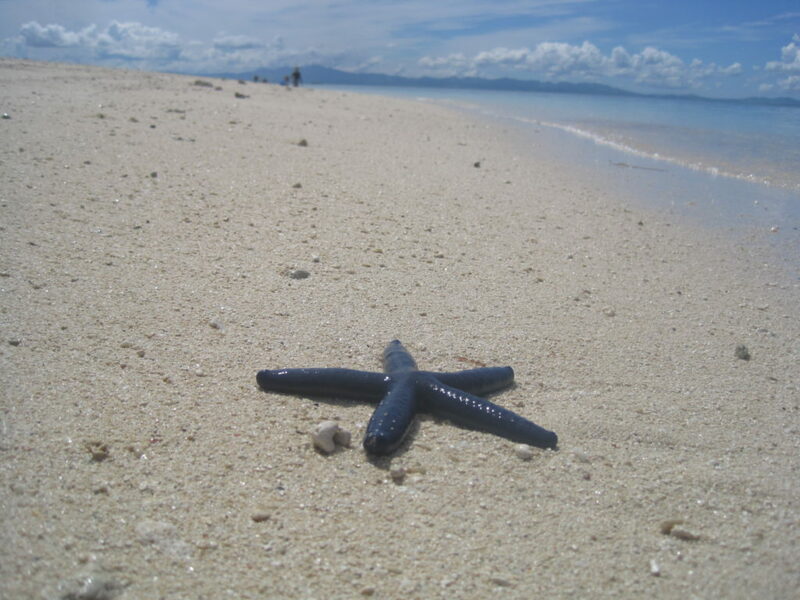 While I waited for Milena to come back, I cruised on the beach, found a little purple starfish that just washed up on shore in front of me so I had to stop for a while. I do love starfish, but you don’t normally see them so close to the shore like this. I made sure to get him back in the water after the photoshoot. 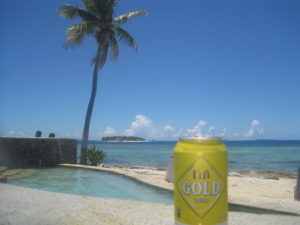 Fiji Beer – I already had drunk my fair share of Fiji Gold Beer…and had to enjoy the local beer in both island groups. I don’t normally take multiple beer shots in a country, but I liked the water color so much….I just did. Enjoying our “second resort” at Treasure Island. This infinity pool entertained us for a long time as the water on the other side of the pool…just gorgeous! 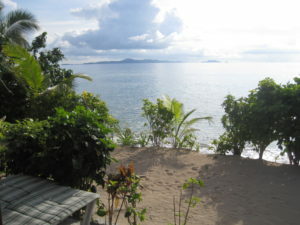 Beachcomber Resort – I’m not going to list any contact info as I won’t/can’t recommend this place. Food was horrible (and had a mandatory meal plan). Best word I could use was “slop”. Positive was the room was nice, we met some nice people, but the resort is not anything as advertised. 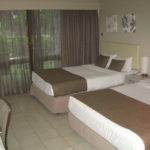 Its catering to a combination of backpackers, mid range and high range and didn’t do any of them well. There are much better accommodations in the area so I would advise to avoid and if anything come for a day trip only. 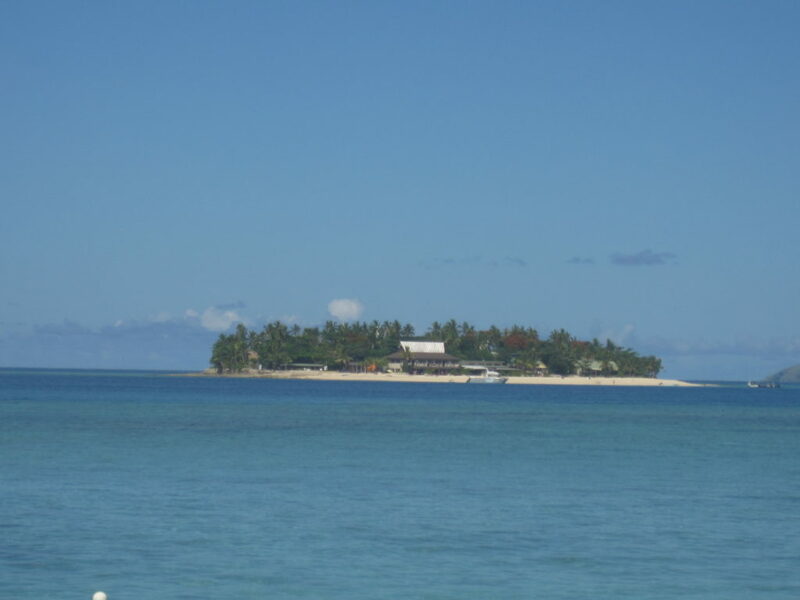 Treasure Island Resort – www.treasureisland-fiji.com. Even though it’s one of Fiji’s oldest resorts, it’s well maintained, the staff was lovely, the food was great (and you could choose from a meal plan or a la carte). I would return here and stay overnight for a few days for sure plus the dive center and activities center was very helpful. Every person we met loved the place and many of the guests are repeat guests.